Lumateperone (INN; developmental code names ITI-007, ITI-722) is an investigational atypical antipsychotic which is currently under development by Intra-Cellular Therapies, licensed from Bristol-Myers Squibb, for the treatment of schizophrenia. It is also being developed by Intra-Cellular Therapies for the treatment of bipolar disorder, depression, and sleep and behavioral disturbance in dementia, autism, and other neuropsychiatric disorders. As of September 2015, lumateperone has passed the first of two phase IIIclinical trials for schizophrenia. In November 2017 the US FDA awarded Intra-Cellular Therapies Fast Track designation for lumateperone. Relative to presently-available antipsychotics, lumateperone possesses a unique and novel mechanism of action. 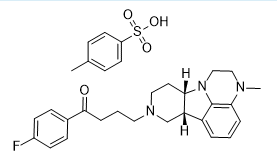 It acts as a 5-HT2A receptor antagonist (Ki = 0.54 nM), a partial agonist of presynaptic D2 receptors and an antagonist of postsynaptic D2 receptors (Ki = 32 nM), and a serotonin transporter blocker (Ki = 61 nM). It also possesses affinity for the D1 receptor (Ki = 52 nM) and lower affinity for the α1A– and α1B-adrenergic receptors (Ki = 73 nM at α1), 5-HT2C receptor (Ki = 173 nM), and D4 receptor. Lumateperone does not significantly bind to the 5-HT2B, H1 (Ki > 1,000 nM), muscarinic acetylcholine receptors, or many other sites (Ki > 100 nM). Lumateperone shows a 60-fold difference in its affinities for the 5-HT2A and D2 receptors, which is far greater than that of most or all existing atypical antipsychotics, such as risperidone (12-fold), olanzapine (12.4-fold), and aripiprazole (0.18-fold). It is thought that this property may improve the effectiveness and reduce the side effect profile of lumateperone relative to currently-available antipsychotics, a hypothesis which is supported by the observation of minimal catalepsy in mice treated with the drug. Moreover, it has been expressed that this property could result in full occupancy and blockade of the 5-HT2A at low doses, with dose-dependent adjustable modulation of the D2 receptor, as well as the SERT, possible with increasing doses, which would uniquely allow for clinical optimization of efficacy and side effect incidence. Unlike most current antipsychotics, such as haloperidol, risperidone, and olanzapine, lumateperone does not disrupt striatal dopamine signaling, a property which is likely due to its partial agonism of presynaptic D2 receptors. In accordance, similarly to aripiprazole, which is also a partial agonist of presynaptic D2 receptors, lumateperone showed no striatum-based motor side effects (i.e., catalepsy) in animals. In phase II clinical trials, lumateperone showed statistically-significant efficacy in improvement of psychosis at a dose of 60 mg daily. In addition, it distinguished itself from its comparator risperidone in reducing negative symptoms, including improvement in social function, as well as in alleviating depressive symptoms in schizophrenia patients with comorbid depression, whereas risperidone had no effect. Lumateperone also distinguished itself from risperidone in that it produced little or no weight gain, did not negatively affect metabolic parameters (i.e., insulin, glucose, triglyceride, and cholesterol levels), did not increase prolactin levels, and did not show a rate of the side effect of akathisia that differed from placebo. In addition, lumateperone did not produce any changes in cardiovascular function, such as QTc prolongation, and unlike risperidone, it did not produce a measurable increase heart rate. Due to its favorable influence on metabolic parameters, it was concluded that lumateperone, unlike many other available antipsychotics such as risperidone, may not cause an increase in the risk of diabetes or cardiovascular disease, and hence may prove to be a significant improvement relative to many existing antipsychotic drugs in terms of long-term safety and tolerability. Lumateperone, at a dose of 60 mg per day, was not found to be associated with any statistically significant treatment-emergent side effects relative to placebo. At a dose of 120 mg daily, the most frequent adverse effect observed was sedation/somnolence, reported by 32.5% of patients. There was no evidence of extrapyramidal symptoms or increase in suicidal ideation or behavior. 5 (367 mg, 53%yield) as a gray solid. 1H NMR (DMSO-d6, 500 MHz) δ 9.10 (br, 1H),8.10−8.01 (m, 2H), 7.48 (d, J = 8.0 Hz, 2H), 7.42−7.33 (m, 2H), 7.11 (d, J = 7.8 Hz, 2H), 6.65−6.57 (m, 1H), 6.51 (d, J = 7.3 Hz, 1H), 6.42 (d, J = 7.9 Hz, 1H), 3.59 (dd, J = 12.2, 6.5 Hz, 1H), 3.52−3.37 (m, 3H), 3.37−3.28 (m, 2H), 3.25−3.20 (m, 1H), 3.18−2.99 (m, 5H), 2.81 (s, 3H), 2.71 (td, J = 10.2, 3.0 Hz, 1H), 2.63−2.52 (m, 1H), 2.28 (s, 3H), 2.27−2.22 (m, 1H), 2.15−1.93 (m, 3H). 13C NMR (DMSOd6, 126 MHz) δ 197.2, 165.1 (d, JCF = 252 Hz), 145.6, 137.6, 137.3, 135.2, 133.1, 130.9 (d, JCF = 10 Hz), 128.1, 126.7, 125.5, 120.6, 115.7 (d, JCF = 22 Hz), 112.5, 109.3, 62.2, 55.5, 52.5, 49.8, 47.8, 43.7, 38.6, 37.0, 34.9, 21.7, 20.8, 18.0. MS (ESI) m/z 394.2 [M + H]+. HRMS (ESI) m/z calcd for C24H29FN3O [M + H]+, 394.2295; found, 394.2292. UPLC purity, 97.7%; retention time, 2.06 min (method A). ITI-007 is a potent 5-HT2A receptor ligand (Ki=0.5 nM) with strong affinity for dopamine (DA) D2 receptors (Ki=32 nM) and the serotonin transporter (SERT) (Ki=62 nM) but negligible binding to receptors (e.g., HI histaminergic, 5-HT2C, and muscarinic) associated with cognitive and metabolic side effects of antipsychotic drugs. ΠΊ-007 is currently in clinical trials, i.a., for treatment of schizophrenia. While ITI-007 is a promising drug, its production and formulation present challenges. In free base form, ITI-007 is an oily, sticky solid, with poor solubility, not only in water but also in many organic solvents. Making salts of the compound has proven to be unusually difficult. A hydrochloride salt form of ITI-007 was disclosed in US 7183282, but this salt is hygroscopic and shows poor stability. 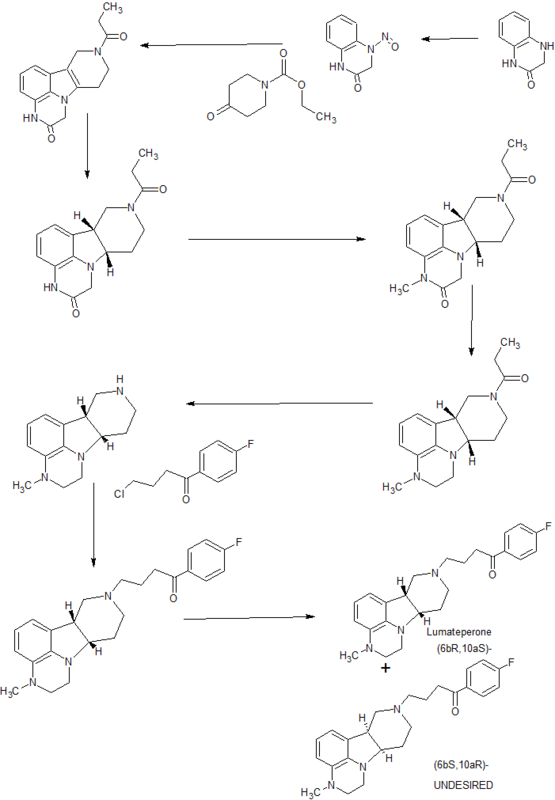 A toluenesulfonic acid addition salt (tosylate) of ITI- 007 was finally identified and described in WO 2009/114181. There is a need for alternative stable, pharmaceutically acceptable solid forms of ITI-007, which can be readily incorporated into galenic formulations. X-ray powder diffraction (XRPD): The X-ray powder diffraction studies are performed using a Bruker AXS D2 PHASER in Bragg-Brentano configuration, equipment #1549 / #2353. The equipment uses a Cu anode at 30kV, 10 mA; sample stage standard rotating; monochromatization by a Κβ-filter (0.5% Ni). Slits: fixed divergence slits 1.0mm (=0.61°), primary axial Soller slit 2.5°, secondary axial Soller slit 2.5°. Detector: Linear detector LYNXEYE with receiving slit 5° detector opening. The standard sample holder (0.1 mm cavity in (510) silicon wafer) has a minimal contribution to the background signal. Measurement conditions: scan range 5 – 45° 2Θ, sample rotation 5 rpm, 0.5s/step, 0.010°/step, 3.0mm detector slit; and all measuring conditions are logged in the instrument control file. As system suitability, corundum sample A26- B26-S (NIST standard) is measured daily. The software used for data collection is Diffrac. Commander v2.0.26. Data analysis is done using Diffrac.Eva vl.4. No background correction or smoothing is applied to the patterns. Simultaneous thermogravimetry (TGA) and differential scanning calorimetry (DSC) or TGA/DSC analysis: The TGA/DSC studies are performed using a Mettler Toledo TGA/DSC 1 Stare System, equipment #1547, auto-sampler equipped, using pin-holed Al- crucibles of 40 μΐ. Measurement conditions: 5 min 30.0 °C, 30.0 – 350.0 °C with 10 °C/min., N2 flow of 40 ml/min. The software used for instrument control and data analysis is STARe vl2.10. Differential scanning calorimetry (DSC): The DSC studies are performed using a Mettler Toledo DSC1 STARe System, equipment #1564. The samples are made using Al crucibles (40 μΐ; pierced). Typically 1 – 8 mg of sample is loaded onto a pre- weighed Al crucible and is kept at 30°C for 5 minutes, after which it is heated at 10°C/min from 30°C to 350 °C and kept at 350°C for 1 minute. A nitrogen purge of 40 ml/min is maintained over the sample. As system suitability check Indium and Zinc are used as references. The software used for data collection and evaluation is STARe Software vl2.10 build 5937. No corrections are applied to the thermogram. Polarized light microscopy (PLM): The microscopy studies are performed using an Axio Vert 35M, equipped with an AxioCamERc 5s, equipment #1612. The microscope is equipped with four lenses: Zeiss A-Plan 5x/0.12, Zeiss A-Plan lOx/0.25, LD A-Plan 20x/0.30 and Achros TIGMAT 32x/0.40. Data collection and evaluation is performed using Carl Zeiss Zen Axio Vision Blue Edition Lite 2011 vl.0.0.0 software. A small amount of sample is loaded on an object glass and carefully spread until a thin layer is obtained. Dynamic Vapour Sorption (DVS): The Dynamic Vapour Sorption studies are performed using a Surface Measurement Systems Ltd. DVS-1 No Video, equipment #2126. The sample is loaded into a balance pan, typically 20-30 mg, and equilibrated at 0% RH. After the material was dried, the RH is increased with 10% per step for 1 hour per increment, ending at 95% RH. After completion of the sorption cycle, the sample was dried using the same method. The software used for data collection is DVSWin v3.01 No Video. Data analysis is performed using DVS Standard Analysis Suite v6.3.0 (Standard). Particle size distribution (PSD): The particle size distribution studies are performed using a Malvern Instruments Mastersizer, equipment #1712. The Mastersizer uses a 300RF lens range of 0.05 μηι – 900 mm. Polydisperse is used as analysis model. Measurement conditions: before each sample measurement a background measurement is performed, the background scan time is 12 seconds (12000 snaps). Each sample is dispersed in Multipar G, refractive index of 1.42. The obscuration range on sample dispersion is between 10%-30%. Each sample is measured 6 times at t=0 and t=30 minutes and the measurement scan time is 10 seconds (10000 snaps). The targeted stirring speed of the sample dispersion unit is 2000+10 rpm. Data collection and evaluation is performed using Mastersizer S Version 2.19 software. Capillary Melting Point: The capillary melting point is determined on a Biichi Melting Point B-545, equipment #000011, conform USP guidelines. X-ray fluorescence (XRF): The X-ray fluorescence studies are performed using a Bruker AXS S2 RANGER, equipment #2006. Using an end-window X-ray tube with Palladium anode and an ultra-thin Beryllium window (75 μιη) for superior light element analysis. As detector the Xflash V5 detector with Cr, Ti, Al, Ta collimator (energy resolution < 129 eV FWHM at 100 000 cps Mnka) is used. The S2 Ranger is equipped with an autosampler with integrated 28 position X- Y automatic sample changer with exchangeable tray, which allows maximum sample diameter of 40 mm. Samples are mounted in steel rings of 51.5 mm diameter for automatic operation. Measurement conditions: disposable liquid cups (35 mm inner diameter, 40 mm outer diameter) with polypropylene foil 5 μιη. As system suitability check a copper disk is measured daily and a glass disk, containing several elements, is measured weekly. The software used for data collection is S2 Ranger Control Software V4.1.0. Data analysis is performed using SPECTRA EDX V2.4.3 evaluation software. No background correction or smoothing is applied to the patterns. Fourier transform infrared spectroscopy (FT-IR): The FT-IR studies are performed using a Thermo Scientific Nicolet iS50, equipment # 2357. An attenuated total reflectance (ATR) technique was used with a beam splitter of KBr. Experiment setup of the collected sample is used number of scans 16 with a resolution of 4from 400 cm“1 to 4000 cm“1. The software OMNIC version 9.2 is used for data collection and evaluation. In TGA-IR, the off-gassing materials are directed through a transfer line to a gas cell, where the infrared light interacts with the gases. The temperature ramp and first derivative weight loss information from the TGA is shown as a Gram-Schmidt (GS) profile; the GS profile essentially shows the total change in the IR signal relative to the initial state. In most cases, the GS and the derivative weight loss will be similar in shape, although the intensity of the two can differ. For this experiment are two devices coupled to each other. The TGA studies are performed using a Mettler Toledo TGA/DSCl STARe System with a 34-position auto sampler, equipment #1547. The samples are made using Al crucibles (100 μΐ; pierced). Typically 20-50 mg of sample is loaded into a pre- weighed Al crucible and is kept at 30°C for 5 minutes after which it is heated at 10°C/min from 30°C to 350°C. A nitrogen purge of 40 ml/min is maintained over the sample. The TGA-IR module of the Nicolet iS50 is coupled to the TGA/DSCl. The IR studies were performed using a Thermo Scientific Nicolet iS50, equipment # 2357. Experiment setup of the collected series, the profile Gram-Schmidt is used number of scans 10 with a resolution of 4. The software OMNIC version 9.2 is used for data collection and evaluation. High performance liquid chromatography (HPLC): The high performance liquid chromatography analyses are performed on LC-31, equipped with an Agilent 1100 series G1322A degasser equipment #1894, an Agilent 1100 series G1311A quaternary pump equipment #1895, an Agilent 1100 series G1313A ALS equipment #1896, an Agilent 1100 series G1318A column equipment #1897 and an Agilent 1100 series G1314A VWD equipment #1898 / LC-34, equipped with an Agilent 1200 series G1379B degasser equipment #2254, an Agilent 1100 series G1311A quaternary pump equipment #2255, Agilent 1100 series G1367A WPALS equipment #1656, an Agilent 1100 series G1316A column equipment #2257 and an Agilent 1100 series G1315B DAD equipment #2258. Data is collected and evaluated using Agilent ChemStation for LC systems Rev. B.04.02. Solutions are prepared as follows: Mobile phase A: Add 800 ml of MilliQ water to a 1L volumetric flask. Add 1 ml of TFA and homogenize. Fill up to the mark with MilliQ; Mobile phase B: Add 800 ml of Acetonitrile to a 1L volumetric flask. Add 1 ml of TFA and homogenize. Fill up to the mark with Acetonitrile; Diluent: 50/50 MeOH/ACN. Solubility of free base in various solvents is evaluated, and based on the results of the solubility range, suitable solvents are selected for the co-crystal screen. Co-crystal formation is based on hydrogen bonding and stacking of the molecules, meaning the co-former selection is based on active groups. Grinding is a method to form co-crystals, however the free base itself is an oil/ sticky solid and therefore not suitable for this method. The free base and counter ion are added to a solution in a certain ratio to give the chance to form a co-crystal, similar to salt formation. We found the best method is to add a saturated solution of the co-former to that of the free base to find an optimal ratio for co-crystal formation. Three different experiments are performed with each of 26 candidate co-formers, which include sugar alcohols, amino acids, and other compounds identified as having potential to for co- crystals; adding solutions stepwise, slurry experiments and cooling crystallization experiments. The free base and co-former are dissolved prior to adding to each other. Co-formers are added in a 1 : 1 , 2: 1 and 1 :2 ratio to the free base. All experiments are performed using four different solvents, methanol, acetonitrile, ethyl acetate and toluene. All solids are characterized by XRPD. Two different ITI-007 free base co-crystals formed, with nicotinamide and with isonicotinamide. Both co-crystals were obtained by slurry experiments in methanol. Both endothermic events do not correspond to the free base or the co-former, which means ITI-007 free base-isonicotinamide co-crystal is formed. HPLC and Ή-ΝΜΡ analyses confirm both of the free base and the co-former to be present. Using isonicotinamide in ethyl acetate, however, does not result in a co-crystal and, no endothermic event is present in the TGA/DSC analysis. The slurry experiment in methanol is repeated at a gram scale. First, ITI-007 free base and isonicotinamide are each dissolved in methanol. Subsequently, the obtained solutions are mixed in a 1: 1 ratio and the resulting mixture is stirred at room temperature for 2 hours. The mixture remains a clear solution, which is evaporated under vacuum to give a brown sticky solid. XRPD analysis shows the brown sticky solid to be crystalline, as shown in Figure 1, ITI-007 free base-isonicotinamide co-crystal has formed. The corresponding peak list is showing in Table 1. The XRPD shows clustered peaks which is likely due to preferred orientation. The present application relates to solid state forms of Lumateperone p-Tosylate and processes for preparation thereof. The drug compound is having the adopted name “Lumateperone” and it has chemical name: l-(4-fluorophenyl)-4-[(6bR,10aS)-2,3,6b,9,10,10a-hexahydro-3-methyl-lH-pyrido[3′,4′:4,5]pyrrolo[l,2,3-de]quinoxalin-8(7H)-yl] 1-Butanone; and a structure depicted by Formula I. International Patent Application Publication Nos. 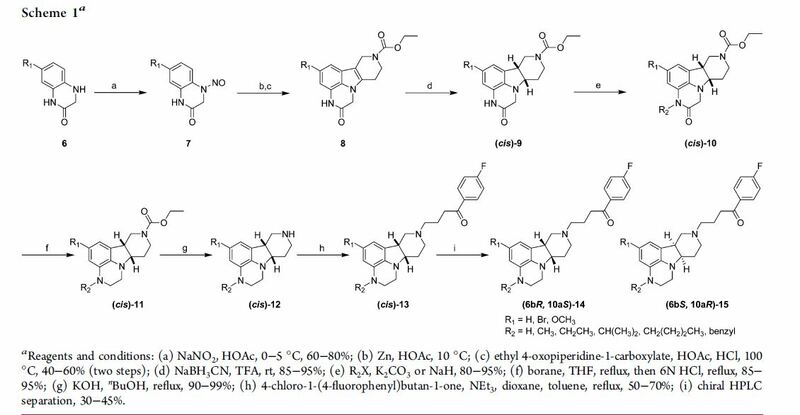 WO2000077002A1, WO2009145900 A 1 and WO2013155504A1 which are incorporated herein in their entirety reported Lumateperone and its related compounds. These compounds have been found to be useful as 5-HT2 receptor agonists and antagonists used in treating disorders of the central nervous system including a disorder associated with 5HT2C or 5HT2A receptor modulation selected from obesity, anorexia, bulemia, depression, a anxiety, psychosis, schizophrenia, migraine, obsessive -compulsive disorder, sexual disorders, depression, schizophrenia, migraine, attention deficit disorder, attention deficit hyperactivity disorder, obsessive-compulsive disorder, sleep disorders, conditions associated with cephalic pain, social phobias, gastrointestinal disorders such as dysfunction of the gastrointestinal tract motility. International Patent Application Publication No. WO2008112280A1 disclose process(es) for preparing Lumateperone and its salts. disclose co-crystal of Lumateperone with iso-nicotinamide, nicotinatinamide, WO 2018031535 Al disclose crystalline Form Fl of Lumateperone ditosylate. Crystalline solids normally require a significant amount of energy for dissolution due to their highly organized, lattice like structures. For example, the energy required for a drug molecule to escape from a crystal is more than from an amorphous or a non-crystalline form. It is known that the amorphous forms in a number of drugs exhibit different dissolution characteristics and in some cases different bioavailability patterns compared to the crystalline form. For some therapeutic indications, one bioavailability pattern may be favored over another. Therefore, it is desirable to have amorphous forms of drugs with high purity to meet the needs of regulatory agencies and also highly reproducible processes for their preparation. In view of the above, it is therefore, desirable to stable amorphous form of Lumateperone j?-tosylate. The amorphous form provided herein is at least stable under ordinary stability conditions with respect to purity, storage and is free flowing powder. Lumateperone j?-tosylate (500 mg) was dissolved in methanol (25 mL) at room temperature for clear solution and filtered to remove undissolved particles. The resultant filtrate was subjected to fast solvent evaporation using rotavapor at about 55°C to afford the solid compound. The said solid was dried under vacuum at about 45°C to afford the amorphous Lumateperone p-tosylate according to Figure 1. Jump up^ Sylvain Celanire; Sonia Poli (13 October 2014). Small Molecule Therapeutics for Schizophrenia. Springer. pp. 31–. ISBN 978-3-319-11502-3. ^ Jump up to:a b c d e Intra-Cellular Therapies, Inc. (2015). “Intra-Cellular Therapies Announces Further Analyses of the Phase 2 Clinical Trial of ITI-007 in Schizophrenia at the 168th Annual Meeting of the American Psychiatric Association”. GlobeNewswire, Inc.
Jump up^ Intra-Cellular Therapies. “Product Pipeline – Intra-Cellular Therapies”. Archived from the original on 2015-05-11. Retrieved 2015-05-19. Jump up^ Intra-Cellular Therapies. “Intra-Cellular Therapies Announces Positive Top-Line Results From the First Phase 3 Trial of ITI-007 in Patients With Schizophrenia and Confirms the Unique Pharmacology of ITI-007 in a Separate Positron Emission Tomography Study”. intracellulartherapies. Archived from the original on 2016-03-21. Jump up^ “Intra-Cellular Therapies Receives FDA Fast Track Designation for Lumateperone for the Treatment of Schizophrenia | Intra-Cellular Therapies Inc”. Intra-Cellular Therapies Inc. Retrieved 2017-11-25. ^ Jump up to:a b c d e f g h i Snyder GL, Vanover KE, Zhu H, Miller DB, O’Callaghan JP, Tomesch J, Li P, Zhang Q, Krishnan V, Hendrick JP, Nestler EJ, Davis RE, Wennogle LP, Mates S (2015). “Functional profile of a novel modulator of serotonin, dopamine, and glutamate neurotransmission”. Psychopharmacology. 232 (3): 605–21. doi:10.1007/s00213-014-3704-1. PMC 4302236. PMID 25120104. ^ Jump up to:a b Nancy A. Melville (2015). “Novel Drug Promising for Schizophrenia”. Medscape Medical News. Jump up^ Li P, Zhang Q, Robichaud AJ, Lee T, Tomesch J, Yao W, Beard JD, Snyder GL, Zhu H, Peng Y, Hendrick JP, Vanover KE, Davis RE, Mates S, Wennogle LP (2014). 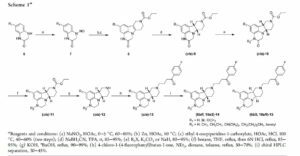 “Discovery of a tetracyclic quinoxaline derivative as a potent and orally active multifunctional drug candidate for the treatment of neuropsychiatric and neurological disorders”. J. Med. Chem. 57 (6): 2670–82. doi:10.1021/jm401958n. PMID 24559051. ^ Jump up to:a b c Davis RE, Vanover KE, Zhou Y, Brašić JR, Guevara M, Bisuna B, Ye W, Raymont V, Willis W, Kumar A, Gapasin L, Goldwater DR, Mates S, Wong DF (2015). “ITI-007 demonstrates brain occupancy at serotonin 5-HT2A and dopamine D 2 receptors and serotonin transporters using positron emission tomography in healthy volunteers”. Psychopharmacology. 232 (15): 2863–72. doi:10.1007/s00213-015-3922-1. hdl:10044/1/24121. PMID 25843749. ^ Jump up to:a b c d e Intra-Cellular Therapies, Inc. (2013). “Intra-Cellular Therapies Announces Positive Topline Phase II Clinical Results of ITI-007 for the Treatment of Schizophrenia”. PRNewswire.